P-B-L's "Proto-Wheels" that really work! 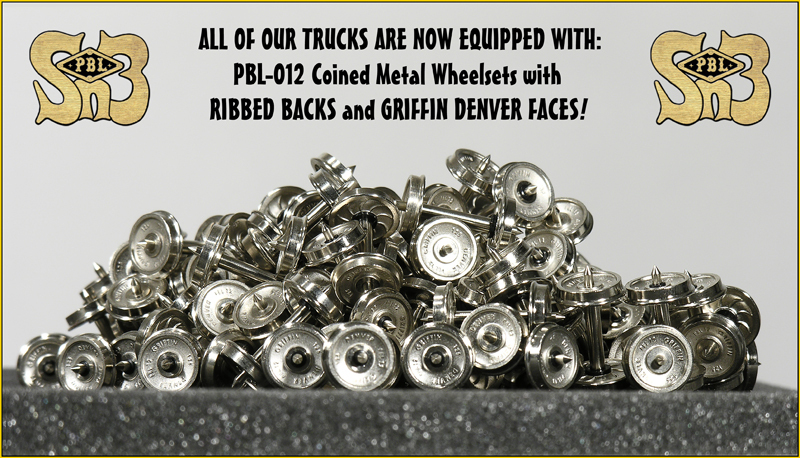 Coined-with-Ribbed-Backs and "GRIFFIN DENVER" Faces, free rolling nickel plated brass wheelsets! Wheelsets should be models too... Ours are! See 'em here! We're P-B-L... This what we do! But for us, with our Eye Level Models, the closer to the prototype their appearance is, in all respects, the more we like what we see... Which is why we designed these wheelsets the way we did... With far narrower tread and flanges than the RP-25 recommendations... Yet our models track as beautifully as they look! So aside from the narrower tread and smaller, more scale appearing flanges, you may still be wondering what else sets these wheelsets apart from the mass produced stuff? This page and its contents are copyrighted material belonging to P-B-L circa 1996-2016.